Xlinks is a digest of interesting links that have been found by the ProjectX staff. 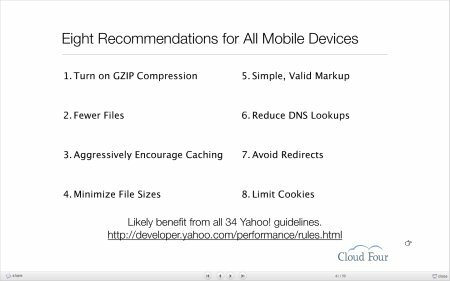 Nat Torkington posted about this presentation by Cloudfour on their research of the mobile web – Going fast on the Mobile Web. It contains some fantastic insights of how iPhone is changing the way that people are using the mobile web. It also outlines their research into how mobile browsers deal with compression and caching. 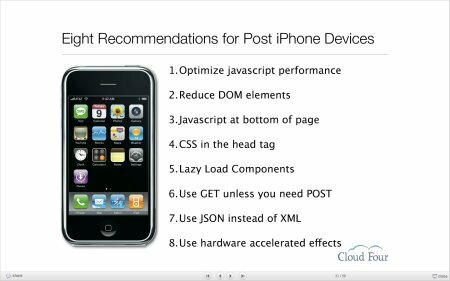 And details 8 tips on how to deliver content on the mobile web. And tips for the iPhone. When you partner that with Steve Sounders research on iPhone caching. Reduce the size of each component to 25 Kbytes or less for optimal caching behavior. The future of the mobile internet is small webpages. Finally, here is the slide deck, its well worth a read. What happens if you have good broadband ? Om Malik has just wrote a post about broadband usage in London. In London there are a numer of providers and they have quality services for WI-FI, Broadband and 3G. Here’s the full report from Ofcom . * 40 percent of people watch TV or video content online. * 20 percent make VoIP calls. * 32 percent are using their mobile phones to access the Internet. * 19 percent listen to audio content on their mobiles. The evidence is mounting better broadband and mobile services will result in more usage and more opportunities for companies / content providers to create new revenue streams. Let’s hope things will change for the better this decade! Why is this good idea ? Its Fast – its hosted on the Google CDN. Its really easy to use. Either call the scripts directly eg. or use the Google API to load them scripts. The AJAX Library API is a fantastic idea, but it could be better. We have a couple of requests 🙂 . can you host more of the legacy versions of the libraries. (We use an old version of prototype. The recent versions are a little bloat for what we need). Properly minify the scripts! Thanks for to Eric for pointing it out. Fix the Website. The FAQ and Groups links are going to the wrong place ! Here is a digest of interesting links as discovered by the ProjectX staff. 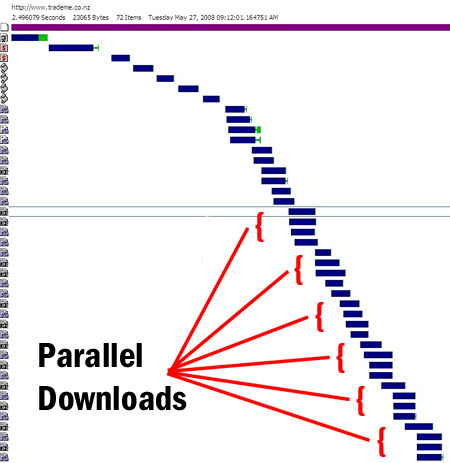 In order to explain what parallel downloading is we first have to illustrate how a webage is rendered by a browser. When you type in the URL and press enter, the browser looks up the DNS for the site, connects to the webserver and requests the base HTML of the site. The browser downloads the file and then starts to parse the HTML. The browser starts to queue up the components of the page it needs to load and then finally begins to render the page. Why do want my site to load in parallel ? The major objective of website optimisation is to minimise the time spent downloading a webpage. One way to achieve this is to load as many components as possible in parallel. (without comprising performance!) The HTTP/1.1 Spec defines that browsers can download two files in parallel from a hostname. As we move more towards the broadband era, we want to promote more parallel downloading to speed up the delivery of our web content. Below I have included the download profile using IE 6.5 of two New Zealand websites to illustrate why parallel downloading is important. Here you can see the download profile of Trade Me Homepage. You can see that the images load in chunks of 4 at a time. This illustrates how you can much you speed up the loading of your page components. How did I get my site to load in parallel? 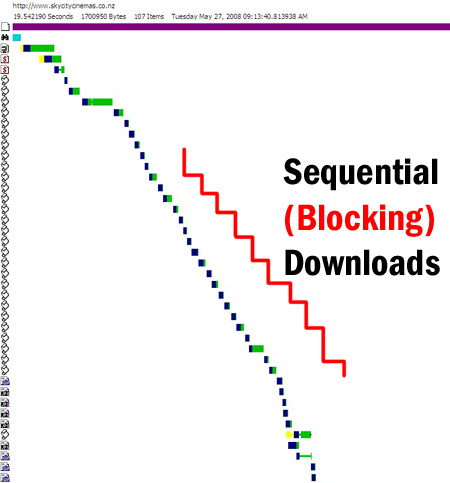 Analyse your current downloading pattern. Use Firebug or SiteTimer to show you how your page is loading. Look for what is loading in parallel and what is loading sequentially. Split your page components across multiple domains. ie. One for images, one for ad components. TIP: Create a domain alias for your site eg. for all your images eg. images.blah.com. The browser treats this as a new domain even though its referencing the same webserver. Example: For ZoomIn maps – we use 4 domains for the map images, that means for a broadband connection the browser can load upto 8 images at a time. Note: YSlow research shows that a total of 2-4 domains per page is optimal. The average backend request size is 27.32K (ie. the size of the base html of page) and that equates to an average of 10.65% of total page size. What this means that is 10.65% of the pages is made up of HTML and the other 89.35% of the page is made up with the other content. This behaviour is a really important aspect of web compression as the faster you can load the backend html, the faster the rest of your site will start loading and more importantly the faster your users can start using the site. Why does web performance matter???? Google has announced that it will start adding page load times into formula for ad ranking. They say that it may have an effect on your keyword score. Here’s what Google says about why they are making the change. Two reasons: first, users have the best experience when they don’t have to wait a long time for landing pages to load. Interstitial pages, multiple redirects, excessively slow servers, and other things that can increase load times only keep users from getting what they want: information about your business. Second, users are more likely to abandon landing pages that load slowly, which can hurt your conversion rate. There is more information at the adwords help center. This part II of my audit of New Zealand Homepages (Part I looked at the top 75 homepages in New Zealand). I have conduct an audit of 320 Government websites looking at their web performance. The audit was conducted by using YSlow to analyse the download performance of the homepage of a Government website. The list of government websites was taken from the New Zealand Government website. Full results are available from this Google Spreadsheet. Audit conducted on Tuesday Night 20th May 2008. 84.1% of Government homepages were not compressed, 11.6% are compressing some of the page elements and only 4.4% (14 sites) are fully compressing their pages. The worst offending pages had over 21 Javscript files and the worst offender for the number of CSS files was 40. Some sites have duplicate versions of scripts running. One site had 4 Google analytic scripts running. I’ve just completed an audit of the 320 government websites as listed in the Government service directory. I’ll be posting the full report tomorrow.